Home » Blog » The 2014 Cybils: Make Me Work! The 2014 Cybils: Make Me Work! It would be really nice for the Cybils folks to send all jurors an unlimited supply of gummy bears, but even without the tasty candy, these awards have succeeded in creating social media buzz for new children’s and YA books and built community among book bloggers from around the world. Jury members are people who blog regularly about books, as I have been doing for four years now with both The Pirate Tree and the “Waging Peace” blog of the online Albany Times-Union. My fellow Pirate Tree blogger Nancy Bo Flood is also representing our site as a first round juror in the Poetry category. This isn’t my first time with the Cybils — last year I served as a first round juror in the Graphic Novel category and liked it enough to come back for more. Now that I have my assignment, it’s time for you to make me work. On October 1, the nomination period opens for two weeks. During this time anyone can nominate a book. You don’t have to be a blogger. You can nominate no more than one book in each category, but you can nominate in multiple categories. The books must have a publication date between October 16, 2013 and October 15, 2014. When you nominate, especially if you do so later on in the two-week period, you should have a list of books you’d like to be considered by us, the jury, because a book can only be nominated once. If someone has beaten you to your favorite book, don’t go away mad — please give another book you liked a chance. Another tip — be sure the book fits into the category. There are ten categories: Fiction Picture Books, Easy Reader/Early Chapter Books, Middle Grade Fiction, Young Adult Fiction (Yay! ), Elementary/Middle Grade Speculative Fiction, Young Adult Speculative Fiction, Elementary/Middle Grade Nonfiction, Young Adult Nonfiction, Graphic Novels, and Book Apps. If you are an author, a publisher, or a self-published author and no one nominates your book within the two-week period, there’s a week between October 16-23 when you can nominate that book yourself. Not getting nominated by someone else doesn’t hurt your chances, nor does it mean no one liked your book. Sometimes books don’t get on anyone’s radar, especially if they don’t have a marketing budget and buzz from a well-known publisher. When I was on the Graphic Novel panel, several self-nominated books made the shortlist. 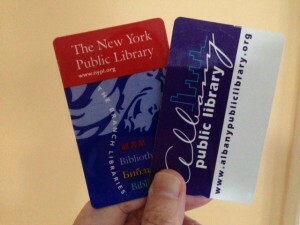 I have two library cards! The first round jurors have a lot of reading to do, because we usually get between 70 and 250 nominations, and from those, we select five or six finalists. The second round jurors then read the finalists and choose the winners. We have a lot of work, but they may have to fight a lot. I’d rather read than fight. Your job is to keep me very busy between October 23 and December 29, when the list of finalists is due. If I’m not busy, I will get into trouble. On this blog I promise to keep you posted on the progress of my reading. My library cards are ready. The nomination period runs from October 1 to October 15. I bet I know what you’re going to nominate! And you won’t make more work for me because I’m reading it right now. Great explanation of the process, Lyn. I’m going to be a 2nd-round judge for Fiction Picture Books and feel excited to be part of the very-democrtic Cybils process, too. Will definitely send in a nomination for your category. Happy judging! I saw that, Julie! Congratulations! I’ll be sure to nominate one in your category and keep my fingers crossed that you’ll get to see it. Last year I didn’t know what I was getting into and was really nervous about being a judge, but now that I’m an “old-timer” I’m really excited. I absolutely love the philosophy of the Cybils. Thanks for outlining it–and the process–for us. Very cool that you and Julie are judging! And I hope you nominate some books this year! Keep in mind you can only nominate one book in each category, but you can nominate in as many categories that you like! SO MANY GOOD ONES TO NOMINATE BUT I THINK I KNOW WHICH ONE I WILL PICK……….maybe. Thank you for commenting, Steph! I look forward to seeing your picks in the various categories.